Born in the cloud, the AMD® EPYC™ system on a chip (SoC) delivers fast and responsive IT with leading-edge security features as well as meeting the performance demands of both existing and future datacentre applications. AMD technologies can be found in a variety of solutions ranging from game consoles to supercomputers. The EPYC processor was designed to support up to 32 cores meaning it can easily share instructions and data among the core using only a single set of memory addresses. 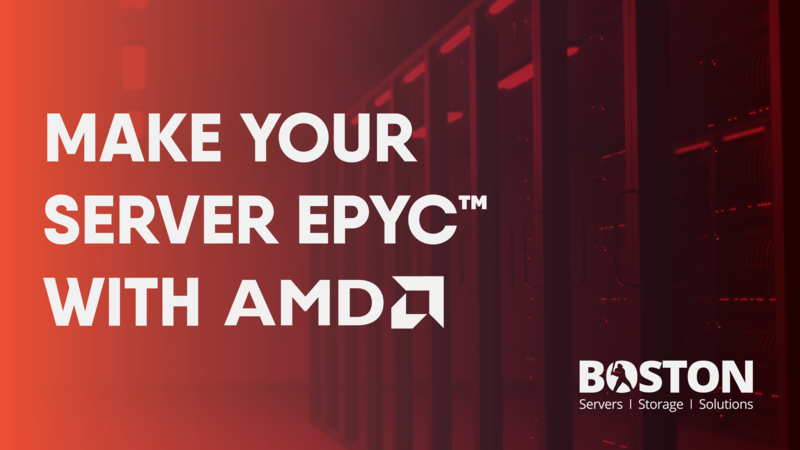 AMD EPYC-based solutions are ideal for general-purpose workloads where you want to maximise price performance, big data analytics workloads that rely on higher core counts and they are suited to certain high-performance computing (HPC) workloads. To read further about the key features of EPYC processors, click here. Of course Boston can tailor a solution to your exact requirements based on Supermicro® building blocks, ranging from entry-level to HPC solutions our sales experts have the know-how to configure your solution to maximise power and lower TCO. If you would like to see the full range of building blocks click here.